A course strategy – and overall race strategy – is a must for optimal performance on race day. Whether this is your first REVEL Mt Charleston race and your goal is simply to finish, or you are veteran aiming for a PR or BQ, you should have a well-planned strategy for how you intend to manage the course! The head coach of REVEL’s Online Coaching Program, who has run a Boston Qualifying time in all the REVEL marathons, including all three Mt Charleston Marathons in 2016-18, has prepared a detailed description of the 2019 Mt Charleston Marathon and Half-Marathon courses. A critical component of your strategy is the course profile itself. Where are the sharp descents? Where are the climbs? Where does the course “flatten” a bit? Starting at almost 7,600’ elevation, the start of the marathon is near the Mt Charleston Lodge on Kyle Canyon Road. The first 1/10 mile is around a small hook shape on the road adjacent to the Lodge, and it is extremely narrow with a short climb. Once you make the turn on that loop, you will be heading back toward the staging area. Then, after you pass the Lodge, the next 1/4 mile climbs almost 60’ as you exit the starting area. This definitely should be just a nice easy warmup for you. Start out nice and slow, and conserve your energy. After you get past this first half-mile, the rest of mile 1 descends about 100' with zero climbing. After the mile 1 marker, the next 3 miles drop well over 770’ total, with an average of 4.6% downhill grade and no climbing until the last 1/10 mile before the 4-mile marker. This is a segment where you do not want to get caught up with the pace of other runners if they are passing you. You still have many miles to go, and you want to conserve your energy for the miles ahead. If you feel yourself working too hard, then simply slow down. 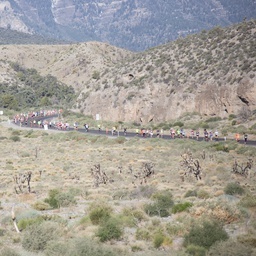 As you approach mile 4, there is a climb of about 40’ as you approach The Mt Charleston Resort on your right. Once you pass the Resort, this short climb is over. Not long after that, just before mile 5, you will reach a roundabout (traffic circle) at the entrance to the United States Forest Service’s Spring Mountains Visitor Gateway. At this point, the course diverts from the main road – Kyle Canyon Road – into the visitor center parking lot. You will make a counter-clockwise loop around the parking lot before re-entering the main road again. The loop around the visitor center begins at mile 4.85 of the marathon. It ends at mile 5.2, so the total distance around the parking area is only about 1/3 mile. However, you will climb about 35’ for the first half of that loop, and then descend the same elevation as you exit the parking lot. When you exit the visitor center parking area, you will be at roughly 6,600’ of elevation. For the next 16 miles, you will lose more than 3,700’ of elevation. That’s an average of about 4.4% elevation loss per mile, which is what makes this course so extremely fast. More importantly, there is only one climb in that entire stretch, and it happens about mile 12.5. That one is a short but very visible climb that is over fairly quickly: the entire climb is only about 1/8 of a mile long. Be wary of a sensation of “running too fast” in this entire stretch of the race. If you feel out of control, or if you feel yourself working “too hard” while running downhill, then slow down. Just past mile 21, you will make a right turn onto the frontage road along U.S. 95. After the previous 16 miles of steady downhill, you will certainly feel how the 4% downhill grade quickly becomes a 2% downhill grade. Keep in mind that you will still lose about 226’ of elevation in this stretch of the race, with no elevation gain. However, the flatter terrain will make it feel like climbing. As you approach mile 23.2, with only three miles to go, you will make a right turn onto Grand Teton Drive. The elevation at that turn is 2,659’. Then you will run a short - but steep - climb to Fort Apache Road, where you will turn left. From that turn onto Fort Apache, it is just over a half-mile to “top out” a slow climb to mile 23.95, where the elevation is 2,690’. After that, the course begins the gradual descent to the finish. Once you reach mile 24, you can say to yourself "now downhill to the finish!" The elevation loss from mile 24 to the finish is over 170’ – a nice downhill for your final 2.2 miles! Better yet, you will encounter terrific crowds who will cheer you towards the finish line of the fast and beautiful Mt Charleston Marathon! The Mt Charleston Marathon course loses roughly 5,100’ of elevation from start to finish. Over the 26.2-mile course, you likely will surprise yourself with your speed on the downhill segments. Although it is generally true that you never want to "go out too fast" in the opening miles of a marathon, remember that gravity is your friend, and you want to take advantage of the benefits of downhill running. Starting at over 4,500’ of elevation, the course drops 1,660’ from the start to mile 8, with zero elevation gain in that stretch. That is an average of more than 200' per mile, which is a significant but manageable descent each mile. You will want to manage the early part of this downhill segment by easing into your pace, settling in for the long haul, and letting gravity pull you along at a comfortably fast pace. You should not feel as if you are running “too hard” or “too fast.” If you do, then you should ease back a bit and aim for a “comfortably hard” pace. Just past mile 8, you will make a right turn onto the frontage road along U.S. 95. After more than 8 miles of steady downhill, you will certainly feel how the 4% downhill grade quickly becomes a 2% downhill grade. Keep in mind that you will still lose about 200’ of elevation in this stretch of the race, with no elevation gain. However, the flatter terrain will make it feel like climbing. Just past mile 10, with about 3 miles to go, you will make a right turn onto Grand Teton Drive. The elevation at that turn is 2,659’. Then you will run a short - but steep - climb to Fort Apache Road, where you will turn left. From that turn onto Fort Apache, it is just over a half-mile to “top out” a slow climb to mile 10.8, where the elevation is 2,690’. After that, the course begins the gradual descent to the finish. Once you reach mile 11, you can say to yourself "now downhill to the finish!" The elevation loss from mile 11 to the finish is over 170’ – a nice downhill for your final 2.1 miles! Better yet, you will encounter terrific crowds who will cheer you towards the finish line of the fast and beautiful Mt Charleston Half-Marathon! The Mt Charleston Half-Marathon course loses more than 2,000’ of elevation from start to finish. With an average loss of more than 150’ per mile, this one of the fastest half-marathon courses you will ever run. Over the 13.1-mile course, you likely will surprise yourself with your speed on the downhill segments. Paul Carmona is the Online REVEL Coach who has designed training plans specifically for REVEL downhill courses. He is a 21-time REVEL Marathon Finisher and has run multiple Boston Qualifiers on every REVEL course. His current streak is 19 BQs in a row at REVEL marathons!